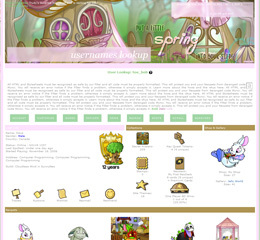 SunnyNeo.com - Neopets Help, Avatars, Graphics & Game Guides! 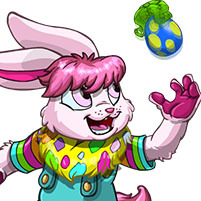 Today is last day of the Negg Hunt, so make sure to stop by the Festival of Neggs! If you need help with todays clue, or are missing any previous neggs, check out our Festival of Neggs guide. A new bunch of Dyeworks has been released, all themed for spring! We have updated our Dyeworks guide with these new items. All those pretty pastel colours! We too have updated our Wearables Headquarters with these new items as well as all the new Festval of Neggs prizes (both from the regular and the NC part of the event). And the new Seekers MME has morphed for the first time, so our MME guide has been updated too. Also, a huge thanks to all the people who help keeping our database up to date by modelling their wearables. You guys are amazing and did a great job over the last few weeks! We love you! Any help you can give us is greatly appreciated! Ready to add some pep in your step this spring? Well step on up and check out this new userlookup! PS, hello friends! My name is Riah (aka Ray or Space Lizard ) and I've joined the SN team to help bring you all sorts of nifty layouts. We hope you enjoy everything we have to offer, and don't forget our graphic request form to let us know what it is you would like to see. Cheers for spring and here's to many more awesome layouts! Let's hope nobody steps on me though! The Festival of Neggs is Back! The Festival of Neggs has returned and so has Topsi! Follow the clues to find the hidden Neggs. Our Festival of Neggs guide is up and ready. If you need help finding the first Negg, the Topsi image below will take you there. If you get any prizes not listed, please Contact Us. Neggs, Neggs, everybody loves Neggs! Today marks a huge turning point in SunnyNeo’s history. Over the past several years, SunnyNeo has been stuck in the 20th century by reporting on news using old-school technology with news posts. Who wants to read anymore? Worry not, because today SunnyNeo changes the entire course of history. We are pleased to announce our partnership with Neovision, the establishment of SunnyTV. SunnyTV is our new live broadcast television network, with thousands of channels of news and entertainment, straight from Neopia. You’ll finally be able to turn on your TV early in the morning and listen to our news anchors report on all the new things in Neopia (and the drama and gossip in the Neoboards) on your smart fridge, television or mobile device!! !!! CHECK OUT SUNNYTV !!! SunnyNeo Wants You - Apply Today! SunnyNeo is always on the lookout for new staff. If you've ever considered joining our team, please apply today! We are in desperate need of content writers such as General Guide Writers and Game Guide Writers. We also could really use a Font Maker to update our older fonts as well as create new fonts for new avatars as they come. We could use people all over the site, so don't hesitate! Apply today! Join our team helping all of Neopia. Are you looking for some older news? Visit our News Archive.